Lumba Sumba Pass Trek is recently discovering trek. It begins from Kanchenjunga Conservation Area to Makalu Barun National park which is offering vast biological diversities. Once, it gives an opportunity to visit the Kanchenjunga and Makalu region in a single holiday. The trekking trail is not only for spectacular Himalayan landscapes, but multiple ethnic groups and their vibrant cultural aspects also. The majestic view of Kanchenjunga and other impressive peaks inspire them to keep a while in Nepal and Tibet border. The wilderness experiences of the mountain no settlements will find during the trek in several days along the path to Lumba Sumba Pass. 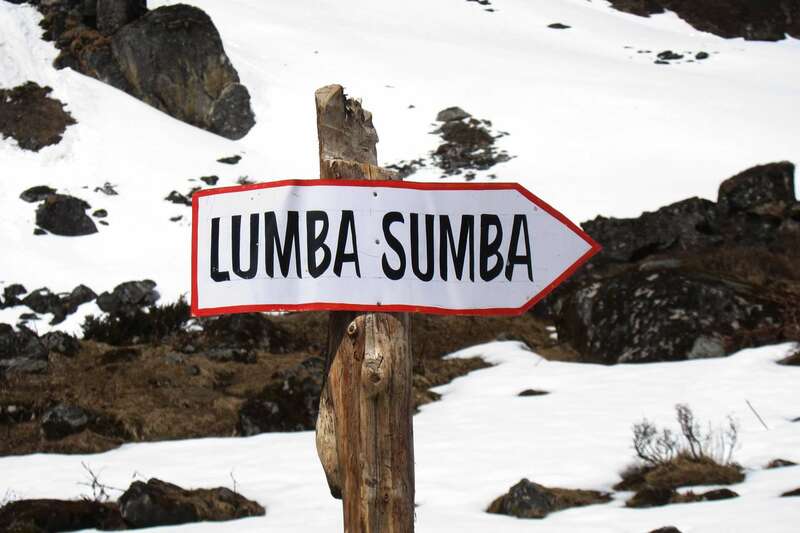 The Lumba Sumba Pass trekking goes through the Kanchenjunga Base Camp Trek route that fires up your adrenaline. It takes a trail to west from Mount Kanchenjunga since it passes through the remote villages and alpine pasture in eastern Nepal. 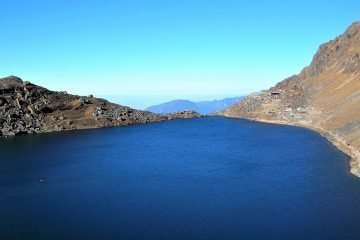 Besides that, it leads us Chyamtang bordering with Kanchenjunga Conservation Area and Makalu Barun National Park. The hidden alpine valley crossing over the Lumba Sumba Pass gives us an extraordinary wilderness and mountain experience. Finally, we arrive at Num the ending point of the trip. Afterward, taking a bumpy road to Tumlingtar to make an airstrip to Kathmandu. Apart from the natural beauty, the trekking trail also aspects the Buddhist shrines like Stupas, Chhortens, monasteries, temples and mani walls. 2: Free day, preparation for trekking. 3: Flight to Bhadrapur then drive to Ilam. 4: Drive to Taplejung and continue to Mitlung 909 m.
19: Tumlingtar – Kathmandu 1h00 flight. 20: Leisure day in Kathmandu. Day 3: Flight to Bhadrapur and drive to Ilam. We will take a flight to Bhadrapur hot and humid Bhadrapur near India Border and drive to Ilam nice and peaceful tea garden stay overnight at Guest House. Day 4: Drive to Taplejung and continue to Mitlung 909 m.
Drive toward a high eastern way to Taplejung and after Taplejung recently build dirt road to Chiruwa via Mitlung. Day 5: Mitlung – Chhirwa (1246 m) 6h00 walk. The second day of the trek also continue to the bank of Tamor River with an easy walk to Furumba then pretty climb up then descend to Siwa bazaar. The trail leads uphill till checkpoint of Kanchenjunga Conservation then gradually descends to Chhiruwa. Day 6: Chhiruwa – Lelep (1690 m) 6h00 walk. The trek leads along the bank of Tamor River encountering several villages and forests to get Tapethok. It is a pretty easy walk to Pembu then upstream to Lalep. Day 7: Lelep – Ela Danda (2050 m) 6h00 walk. As usual as another day, the trek follows along the bank of Tamor River through the dense forest that offers good habitat for wildlife. And cross a suspension bridge then climb up through the Pine forests till reach a monastery. Then, the trail gradually climbs up to Gowatar with few settlements. Then continue to walk to the bridge to cross the Tamor River then climbs up to Ela Danda. Day 8: El Danda – Selep Kharka (2525 m) 6h00 walk. 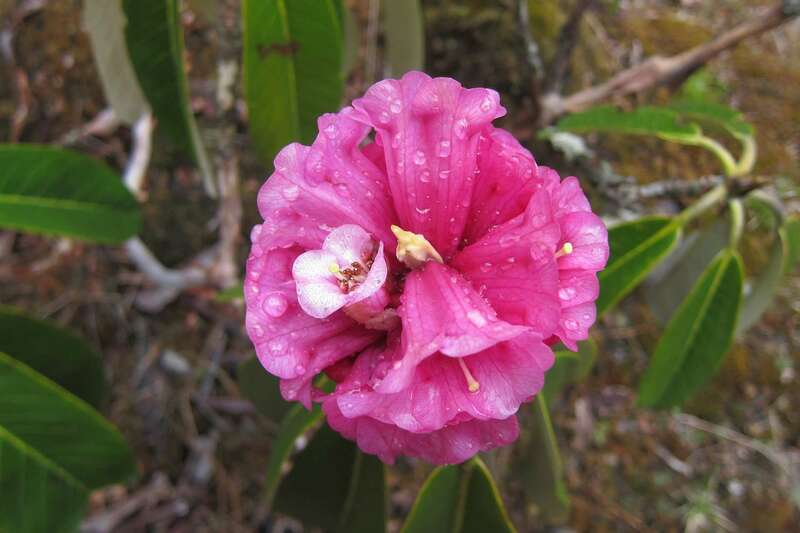 Start trek easy walk along the forest of rhododendron till bridge and crossing it. The trek goes dense forest of Bamboo which inhabitant of Red panda often can be seen path itself. The trek passes through the Rhododendron forest. It appears big landslide on the way and needs to be careful while crossing it. And continue to walk to Selep Kharka. Day 9: Selep Kharka – Olangchulg Gola (3210 m) 5h00 walk. The trail is a fascinating walk along the bank of Tamor River leads to Jongim a flat place surrounded by snow-capped hills. And continue walking through the rhododendron forest take to the suspension bridge and climbs up to Ratamate village. The place is popular as the habitat of red panda once often can be seen on the path. The trail leads continue to Olangchung Gola passing by the waterfall. 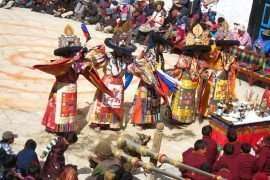 Olangchung Gola is the border with Tibet. This is an eventual settlement after that no more settlement; its complete wilderness for next three days passing through the rhododendron forest with snowy trail brings to upper Langmale. Day 11: Upper Langmale – Pass Camp (4750 m) 6h00 walk. 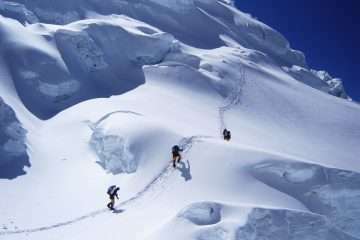 It can be an exciting walk along the snowy track and no human being and settlement. There is a possibility to sight the snow leopard. And continue walking through the barren lands to Pass Camp. Day 12: Pass Camp – Chauri Kharka (4595 m) 7h00 walk. This is the most difficult and rewarding day of the trek. The trek goes to Lumba Sumba Peak (5200 m). The trail takes bit up and down, a long day walk to get peak then descend to Chaurikharka. Day 13: Chauri Kharka – Thudam (3500 m) 6h00 walk. The trail goes downhill and comes back to civilization after the exhausting walk for three days in the wilderness continue to Thudam village close to Tibet border. Day 14: Thudam – Kharka (2877 m) 6h00 walk. 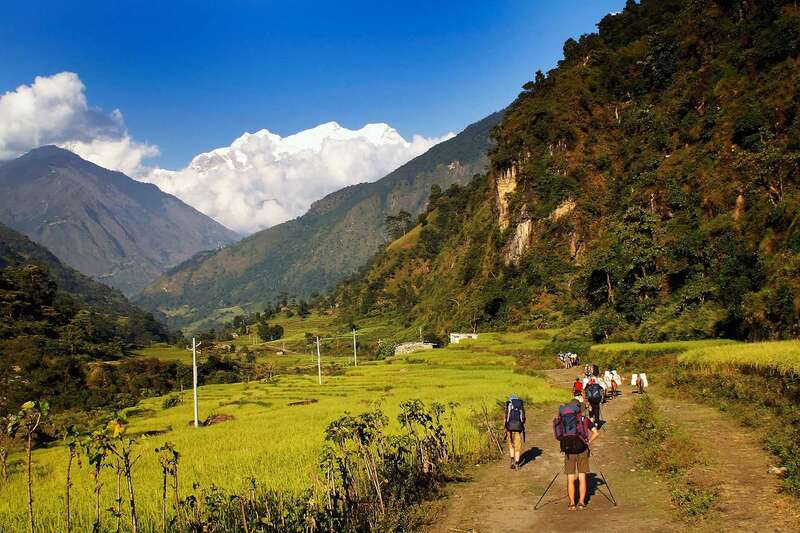 The trail leads along the bank of Chujung Khola and offers a majestic view of Makalu. Finding water sources along the trail is difficult. And continue to walk to Kharka. Day 15: Kharka – Chyamtang (2230 m) 6h30 walk. This is a bit confused in the dense forest of rhododendron because there are villages and numerous side trails in the forest. And continue to walk to Kimathanka then downhill to Arun River. After crossing a bridge climbs up to Chyamtang. Day 16: Chyamtang – Hatiya (1595 m) 6h00 walk. The trail enters to Arun valley which is popular for species of birds. As we walk along the forest tweeting of birds that makes refreshed. 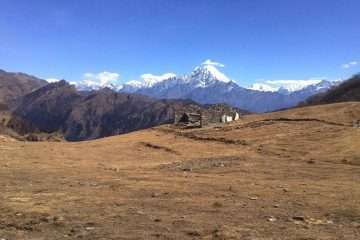 And continue to walk to Glimber village that offers the glimpse of Makalu range. And easy long walk to Hatiya. It is an entry Point of Makalu National Park. This is a delightful walk in the low land with a short climb and descends through the paddy fields and villages along the whole trail. Finally get Gadhi. Gadhi is a historical place where the Nepal Army fought against Tibet during Nepal land Tibet war. Today is last day of the trek just 30 minutes from Gadhi then catch a bus to Khandbari along the bumpy road. Day 19: Tumlingtar – Kathmandu 1h00 flight. Early morning take a flight to Kathmandu from Tumlingtar with spectacular views of the eastern mountain as well as Mt. Everest and its ranges. You will have a whole day as free, rest and visit. DEPARTURE TIME Please enter not less than 3 hours before the flight. Rates are quoted for the particular product at the time of quotation and these prices may vary at any time subject to change without prior notice due to currency fluctuation, fuel prices and/or unforeseen economic circumstances. All prices published on our websites are set as low as possible. But we guarantee our prices which have already signed up for your tour. Please Contact us to Get a custom quote.